(c) 2012 Dow Jones & Company, Inc.
Online marketing company Constant Contact Inc . said Wednesday it has agreed to acquire SinglePlatform Corp ., a venture-backed company that helps local businesses develop an online presence. Constant Contact said it will pay about $65 million in cash for the acquisition and an additional $10 million to $30 million if SinglePlatform achieves certain revenue objectives. As part of the deal, Constant Contact will pick up the entire team behind SinglePlatform's chief executive, Wiley Cirelli, for an earnout of about $5 million in cash and equity compensation after two years. SinglePlatform enables local businesses to manage their Web presence by integrating their websites, Twitter and Facebook accounts, and mobile applications in a single place. SinglePlatform also syndicates their content to a network of about 100 digital publishers, among them some big partners like the New York Times and Foursquare, that reach more than 200 million consumers a month. Constant Contact CEO Gail Goodman said Wednesday that SinglePlatform will help the company in its mission to help small businesses grow customer relationships. "Almost 50% of local searches for consumers are done without any specific destination in mind," Ms. Goodman said. "As a small business, when that search happens I want to make sure that I'm found. That's the problem SinglePlatform solves unbelievably well." Ms. Goodman also stressed that the Boston-based company, with more than 510,000 paying customers, expects to benefit from SinglePlatform's popularity among small businesses and its existing customer base, which according to the company itself includes more than 600,000 free listings nationwide. "We are looking at it as a 'front door' for businesses to find their first Constant Contact solution," Ms. Goodman said. "After that first entry point, we will be able to introduce them to the rest of our tools." As part of the deal, small businesses will be able to create basic listings for free and post them online through SinglePlatform's publishers. "We believe that getting our basic information accurate all across the Web and mobile is a basic right of small businesses, and they shouldn't have to pay for that," Ms. Goodman said. Cirelli previously founded SeamlessWeb, an online food delivery platform that sold to Aramark Corp . in 2006. Spectrum Equity Investors now owns a minority stake in SeamlessWeb. Investors in SinglePlatform included DFJ Gotham Ventures, First Round Capital and RRE Ventures . SinglePlatform had raised about $4.5 million in three rounds since it was founded in early 2010. Charlie O'Donnell, a former First Round investor who sourced SinglePlatform for the firm, said the deal is a great outcome for the company and the fund. "SinglePlatform was funded appropriately, only taking $4.5 million to create potentially $100 million. Very few acquisitions hit this kind of value," he said. Howard Morgan, a partner at First Round who made the investment in SinglePlatform in 2010 and has served on the board since then, said the value of the company was helped along by Mr. Cerilli's skills as a salesman. "Wiley knows how to build a sales force better than anyone else," Mr. Morgan said. "He has been able to take untrained sales people and train them and get them productive within two weeks, which is something we've never seen in any other company." Mr. Morgan said he believes if Cerilli had waited another couple of years they could have sold the company for a lot more money but that the purchase price was fair for now. "At First Round, our view is that the entrepreneurs make this decision," Mr. Morgan said. "Our fund is structured so that we do very well with early exits. This is why we make many times our initial investments." Mr. Morgan didn't disclose the amount First Round invested in SinglePlatform. The company also had offers for new rounds of funding, he said. Facebook users can now chat on video with multiple people on the social networking site thanks to the ooVoo app. This week the social video-chat start-up said it upgraded its Facebook app so that up to 12 participants can take part. Until then, Facebook users could only chat with one other person on video through Skype. The fast-growing start-up now has 47 million users worldwide on its iPhone, Android and desktop apps. According to ooVoo about 100,000 new customers per day download their video-chat app across all platforms. AFP/Getty Images. 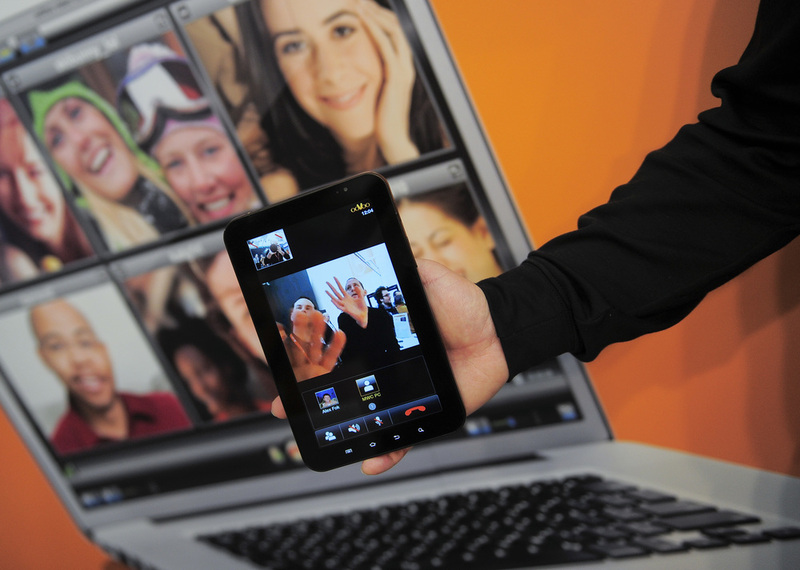 OoVoo’s iPhone, Android and desktop apps have more than 47 million users. Digits sat down with ooVoo Chief Executive Robert Jackman, who was one of the leading forces in the strategic development of the Facebook app to talk about how the video-chat provider leverages the world’s largest social network, and its efforts to offer a product beyond video-chat services provided by Google+ and Skype. Q. You just introduced some new extensions to your service–among them a new Facebook app–which lets users connect via video chat on the social platform. What was the motivation for you to be represented on Facebook? A. We realized that in our vision of having a company that was at the interaction of social and communications that being integrated within social networks like Facebook was very important to our growth. If you think about where users are spending their time today, they’re in many different platforms–on Facebook, on their mobile devices, on a desktop, on an iPad. The mission of our company is to be able to connect you anywhere you are with any other like-minded person. That’s an exciting and big vision and in order to do that you have to connect people where they are. That’s where the Facebook idea came from. On our new Facebook app users have access to the people not only who use ooVoo but people who are just Facebook clients. You don’t have to be an ooVoo client to use the app. So, that’s a huge community we have access to on Facebook. Q. How much do you expect your user base to grow through the new Facebook app? A. When you release a new application it’s very hard to predict the growth. I will tell you that a few weeks ago we put the application on Facebook and didn’t tell anybody about it and just let users find it. Over a period of three weeks we gained 350,000 users without telling anyone about it. These were just users who searched for ooVoo and by chance found the application on Facebook. Based on that we hope we’ll have a lot of growth through the app. Q. How did you start developing a relationship with Facebook? A. We didn’t have a special deal we cut with Facebook. The platform has a set of open APIs that let you develop your own application. Every developer can take advantage of that and we decided to do so. Today we have some interaction with them but no formal relationship. Q. Google has incorporated video chat into its Google+ platform in a big way. How does ooVoo compare to Google+ Hangouts? A. The major difference is our vision of video chat that is based on an open communications and the ability to connect with anyone anywhere. You need to be a Google+ member to use Hangouts. Our video works between platforms. We’re not forcing you to be an ooVoo user because we can connect you through the Web or Facebook. We can allow you to tweet out the link to your ooVoo call and have someone who has never had an ooVoo experience come into your environment and have a video call with you. Our mission is no matter where you are to try to connect you. This is a big business for us because we see our users have significant engagement on our product across platforms. Our average user spends about 200 minutes per month with ooVoo. We do over 1.5 billion minutes total a month now. In 2011 we did 10 billion minutes of video. That is a lot of screentime and currently we get 100,000 downloads per day. Q. Isn’t it harder to build up a brand if you don’t require people to become members if they want to use your service? A. I don’t think so because in all our experiences you’re going to see our name and know that you are connecting through ooVoo. I think when consumers consistently get a high quality experience in the place that they want to connect that there’s a lot of value you’re delivering them. That’s how they become associated with you and your brand. Then they want to be your customer and that’s what we want. Q. Video chat has been suffering from bad quality of the visual for years. How are you trying to solve that problem? A. Part of the problem with video chat is that it requires a lot of bandwidth. We have been able to deliver a lot of quality by having a cloud-based service as opposed to a peer-to-peer service where you rely on all the computers in the chat for the quality of the chat and if one has bad bandwidth all others suffer from it. In our cloud-based architecture all of our streams are mediated through a central server that’s in the cloud. That allows us to deliver the best bandwidth to everybody on the call. Also, as time has gone on networks have gotten better. There are high-speed 4G networks available today. And the quality of the cameras has also been improved.